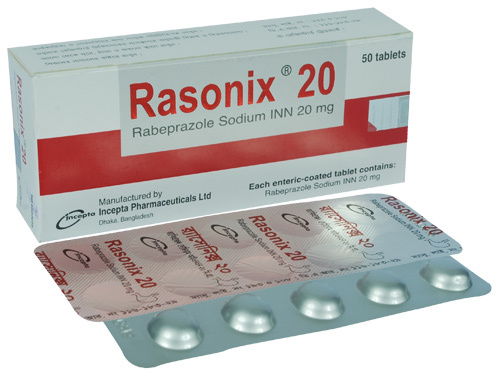 Rasonix 20 tablet: Each enteric-coated tablet contains Rabeprazole Sodium INN 20 mg.
Rasonix 10 capsule: Each sprinkle capsule contains Rabeprazole Sodium INN 10 mg. The active ingredient in Rasonix is Rabeprazole sodium, a rapid acting proton pump inhibitor (PPI). Rabeprazole is a substituted benzimidazole which suppresses gastric acid secretion by inhibiting the gastric H+/ K+ ATPase at the secretory surface of the gastric parietal cell. This enzyme is regarded as the acid (proton) pump within the parietal cell. Rabeprazole blocks the final step of gastric acid secretion. The stability of Rabeprazole sodium depends on pH; it is rapidly degraded in acid media, and is more stable under alkaline conditions. Because of its enteric coated formulation Rasonix is highly stable in stomach and higher pKa value of Rabeprazole provides faster action compared to other PPIs. 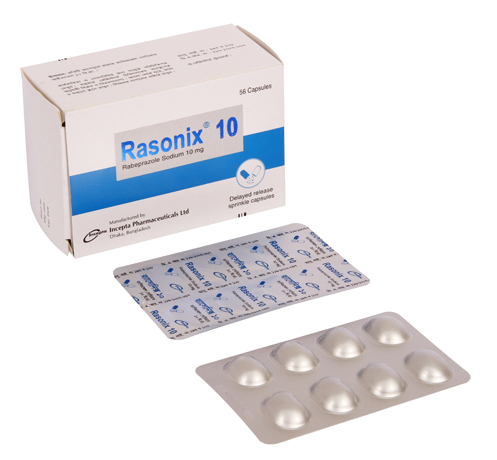 i) Duodenal ulcer: Rasonix 20 mg tablet in the morning is indicated for 4 weeks treatment in the healing and symptomatic relief of duodenal ulcer. Most patients heal within 4 weeks. ii) Benign gastric ulcer: 20 mg daily in the morning for 6 weeks, followed by a further 6 weeks if not fully cured. iii) Duodenal ulcer and benign gastric ulcer associated with H. pylori infection: Rasonix in combination with Amoxicillin and Clarithromycin as a three drug regimen is indicated for the treatment of patients with H. pylori infection and duodenal ulcer disease. Rabeprazole offers a faster therapy option than other PPIs, up to 10 to 14 days 20 mg once daily. iv) Healing of erosive or ulcerative Gastroesophageal Reflux Disease (GERD): 20 mg daily in the morning 4 to 8 weeks. Those patients who have not healed after 8 weeks of treatment, an additional 8-week course of Rasonix may be considered. v) Treatment of symptomatic GERD: The recommended adult oral dose of Rasonix is 20 mg once daily for 4 weeks. If symptoms do not resolve completely after 4 weeks, an additional course of treatment may be considered. vi) Maintenance of healing of erosive or ulcerative GERD: Rasonix is indicated for maintaining healing and reduction in relapse rates of heartburn symptoms in patients with erosive or ulcerative GERD maintenance. Controlled studies do not extend beyond 12 months. vii) Prevention or treatment of NSAID-induced ulcers: Rasonix 20 mg tablet once daily, in patients receiving treatment with NSAIDs. viii) Zollinger-Ellison Syndrome: The recommended adult oral starting dose is 60 mg once a day. Doses should be adjusted to individual patient needs and should continue for as long as clinically indicated. Some patients may require divided doses. Doses up to 100 mg once daily and 60 mg twice daily have been administered. • Less than 15 kg: 5 mg once daily for up to 12 weeks with the option to increase to 10 mg if inadequate response. • 15 kg or more: 10 mg once daily for up to 12 weeks. Pregnant women: Rabeprazole is FDA pregnancy category B. No data are available on administration of Rabeprazole to pregnant women. However this drug should be used during pregnancy, only if clearly needed. Lactating mother: There are no data on the excretion of Rabeprazole into the breast milk. A decision should be made whether to discontinue nursing or to discontinue the drug, taking into account the benefit of the drug to the mother. The safety and effectiveness of Rabeprazole in pediatric patients have not been established.